How to make an injection of PharmaNan-D 600 (a very high concentration of the substance)? Pharma Nan D600 is a steroid preparation with high anabolic and moderate androgenic activity. At the core of the tool is nandrolone decanoate – this is the most popular nandrolone ester, distinguished by the duration and power of its action. 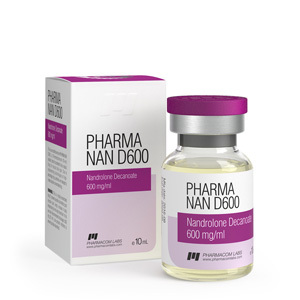 Today, the steroid Pharma Nan D600 is used primarily in sports practice. For example, bodybuilders and athletes in other heavy sports regularly use it to gain muscle mass. The drug can also be used for medical purposes, because it helps to saturate the body with oxygen, strengthens the immune system and the bone structure of the body. A new product inspection system for originality was added to PharmaCom Labs new products, which implies the introduction of a security code on the official website (in earlier batches there was no such protection system yet). You can find this code under a protective layer on a special sticker, which is glued either to the blister or to the drug can. The steroid nandrolone decanoate (chemical name – 19-nortestosterone), which is the active ingredient of this anabolic, has a 150% anabolic and 30% androgenic capacity of endogenous testosterone. It acts, and, therefore, PharmaNan-D 600, for 15 days. This causes the required frequency of anabolic injections – 1 time per week. The detection period for nandrolone during the doping test is 22-24 months, which completely excludes the possibility of its use in preparation for competitions. In structure, the steroid Pharma Nan D600 (nandrolone decanoate) is similar to testosterone. The main difference between them lies in the presence of a carbon atom at position 19 at the first and in its absence at the second. There is another distinctive feature: nandrolone is not converted into more androgenic metabolites, while testosterone is subject to these reactions, which leads to certain problems during its use. • Strengthened immune responses and overall immunity.